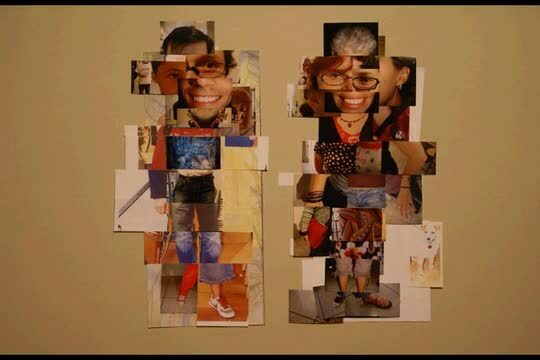 Quick Time video of an interactive project originally commissioned by the San Jose Museum of Art on the subject of identity. Life-size side-by-side charts of the skeletal structure of a woman and the muscular structure of a man were covered by a collage of dozens of 4” x 6” photos of corresponding body parts. At the interactive event, I photographed a body part of a visitor to my exhibit, printed it on site in a minute, and asked the visitor to go to the photos on the wall and take down the corresponding photo and pin up their photo. When taking down the photo, the underlying image of skeleton or muscle would be exposed with the intention of making the visitors question what that meant: no matter what the outside looks like, we are all the same underneath. Each time a photo was taken down and each time a new photo was put up, a photo was taken to document the changes over time and were turned into this Quick Time video.